At the 10th anniversary 4-H Legacy Awards nearly 450 business leaders, philanthropists, celebrities, prominent alumni, special guests and dignitaries joined National 4-H Council at the Ritz-Carlton in Washington, D.C., to recognize the accomplishments of our nation’s youth and those individuals that make it possible for millions of young people to learn important life and leadership skills through 4-H youth development programs. Emceed by TV personality, author and chef, Carla Hall, the evening recognized notable attendees including, Grammy award-winning singer and songwriter, Jennifer Nettles, who received the 4-H Brand Champion Award; Triple crown winning race horse trainer, Bob Baffert, IndyCar Race winner, Charlie Kimball, Colonel Ericka Flanigan of the U.S. Air Force, and Congresswoman Cathy McMorris Rodgers who all received the Distinguished 4-H Alumni Medallion. 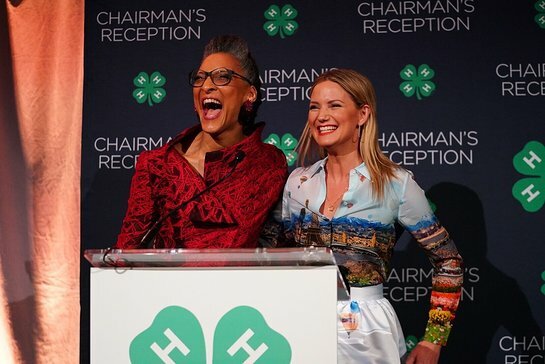 During the event, each honoree shared personal reflections on how 4-H provided life-changing experiences that inspired them to become who they are today. In addition, Phil Blake, President of Bayer U.S. accept the 2019 Corporate Leadership Award on behalf of Bayer for the company’s continued commitment and longstanding partnership with 4-H to help foster the next generation of STEM (science, technology, engineering and math) leaders in agriculture. Clyde Van Dyke, 18, of Johnson City, NY, was also selected as the national winner of the 2019 National 4-H Youth in Action Award and will receive a $10,000 scholarship, sponsored by HughesNet. Finally, the induction of the 2019 Class of 4-H Luminaries took place with the addition of seven accomplished and influential 4-H alumni that will help raise awareness of the life-changing 4-H impact and generate support for bringing 4-H to more youth in need. Thanks in part to the support of Legacy Premier Partners Bayer, Microsoft, Altria, HughesNet, Google and Lockheed Martin, the event serves as National 4-H Council’s premier fundraising event inspiring supporters to help grow true leaders and reach 10 million young people through 4-H by 2025. To view more photos from the 2019 4-H Legacy Awards, visit www.4-H.org/gala.